I don't much care for Bjork's song 'Declare Independence' but the line about "make your own flag" caught my imagination. I started getting interested in vexillology and heraldry in first grade when my grandpa gave me some children's guidebooks on the subjects. I still think the symbolism of colours, shapes and icons is fascinating. Although I know that technically individual people can't have their own flags, I felt inspired to design one just for me. 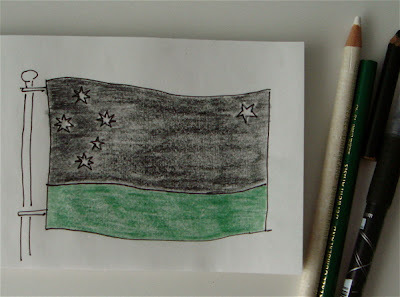 My flag is a horizontal bicolour with a field of sable and green, which I think look great together. The ratio is 2:1 in a sort of 'earth and sky' layout. Surprisingly, there are no existing flags of note with this colour combo. Mine is an astronomical flag: within the hoist, there are the five seven-pointed stars of the Aussie-style Southern Cross. Within the fly, there's the north star. I chose northern and southern astronomy to represent both my background and that pull of opposites which appeals to me so much. It's pretty basic, but what do you think? Why not make your own flag, too? My favourite national flag designs are the Welsh Red Dragon and the South Korean Taegeukgi. The Union Jack is undeniably stylish, too. Great that you like our Welsh dragon. If we're getting technical about flags, it's only called the Union Jack if it's been flown from a ship or a boat of the Royal Navy. Otherwise it's the Union Flag :). I like your own design though; well thought out!